A collection of shallow, fairly meaningless observations, over analyzed. Just Replace the Toilet Paper Roll. All the way! 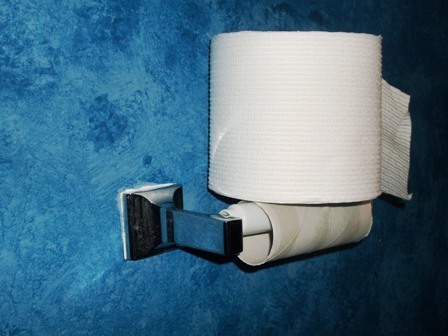 On occasion, I find the following in the restrooms in my home: a new, full roll of toilet paper sitting atop a spent toilet paper cardboard roll still in the holder. I’ve not caught the roll-replacer adverse in the act. In fact I suspect there are multiple offenders. I guess I understand. After all, a lot of effort was made to reach for and take hold of the new roll. Why would you spend 7.8 seconds removing the cardboard roll and replacing it with a new roll? That’s 7.8 seconds! You’ll never get that time back. How do I know it takes 7.8 seconds? Oh, I recorded this video. (music credit: Easily Replaced, by The Vandas). This entry was posted in Family, Music, Nerd! and tagged Bathroom, Cardboard, Replace, Roll, Toilet, Toilet paper. Bookmark the permalink. 4 Responses to Just Replace the Toilet Paper Roll. All the way! I’m laughing so hard that you made a video. Classic. I felt a demonstration video was in order. Really underscore the point. “the roll-replacer adverse” –This needs to be used in everday language, everywhere. Great post! Thanks! I got a kick out of putting it together. Copyright® Trenton A. Scovell, 2011 – Forever. All Rights Reserved.